Venom has to be one of the reigning kings, along with Wolverine and soon Deadpool, of the mini series. 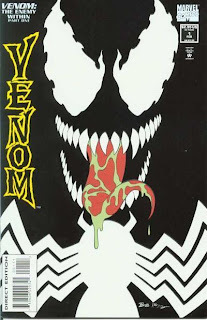 Once Marvel recognized that Venom was one of their most popular characters in the 90's they latched on to the unusually long tongued ex-villain. Building a new mini around Venom wasn't enough to draw readers in when Venom: The Enemy Within #1 hit comic shops. Marvel tricked out (do the kids still say that?) 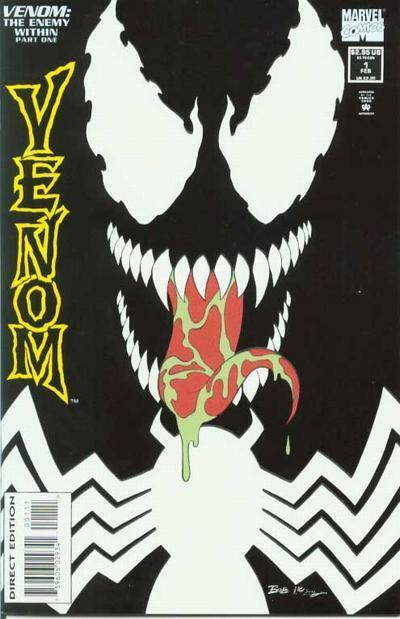 the cover with a glow in the dark version of Venom. When the lights go out Venom's teeth, eyes and spider logo remain...scaring children who thought it was just another Venom cover. I know what you are think...I was one of those children. I knew it had to be a glow in the dark cover because when scratched and sniffed the cover it did not smell like anything I recognized. Later, when I was cleaning up in the bathroom before bed I turned the lights off in the bathroom before I fully left the room and noticed my glowing finger tips and nose. Was that a true story? Of course not. I'm afraid of the dark. There is always at least a nightlight on around me. The cover actually goes along with the story of the mini, The Enemy Within. The story involves creatures and monsters of the night. The comic is filled with hundreds of little goblins, Morbius the vampire, and Demogoblin (a Spider-Man villain who is pure evil...loves eating babies). Venom: The Enemy Within #1 pretty much just introduces these characters. Readers are left wondering what the heck is going on, and what would happen if Venom fought everyone. To be fair, that is what readers are always thinking when it comes to Venom. There are not many Venom comics of the day where I wonder about Venom's thoughts on his favorite Kurt Vonnegut book...yet. Marvel, feel free to use that idea. You're welcome.